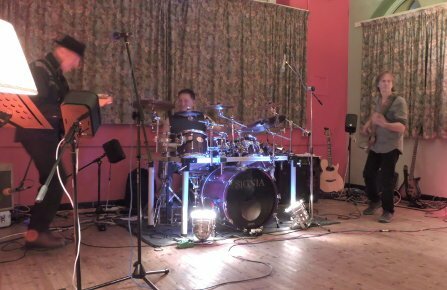 4 Parts Blue brought us a wealth of standard blues classics that got the feet tapping from the first note. It wasn't long before quite a few in the audience just couldn't stay still any longer and got up to dance. 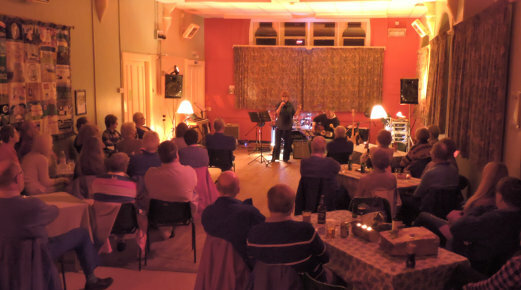 An irresistable, polished performance from all three members of the band who together romped their way through two highly entertaining sets which had all the hallmarks of a tightly knit, highly experienced trio. 4 Parts Blue playing "That's O.K." 4 Parts Blue playing "The Thrill is Gone"
Tansy Rice & James Goodwin performing "Throw It Away"
Nisheetha Thornycroft (vocals), Steve Symes (guitar), Chris Knox (Keyboard), and Trevor Melhuish (bass) - all residents of Hollocombe and co-founders of this club - gave us a well rehearsed set of three popular songs. Quite impressive. The HMC Band performing "You've got a Friend"